‘Ridge Augmentation’ is a procedure performed following a Tooth Extraction to help recreate the natural contour of the gums and jaw that may have been lost following an extraction (or for other reasons) and which has left a large depression, cleft or crease in the gum. The alveolar ridge of the jaw is the bone that surrounds the roots of teeth. 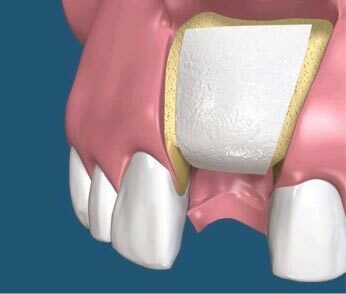 When a tooth is removed, an empty socket is left in the alveolar ridge bone. Usually this empty socket will heal on its own, filling with bone and tissue. Sometimes when a tooth is removed, the bone surrounding the socket collapses – or is lost – and is therefore unable to heal on its own. The original height and width of the socket will continue to deteriorate as the socket heals. Rebuilding the original height and width of the alveolar ridge may be required for Dental Implant placement or for aesthetic purposes. Dental Implants require bone to support their structure and Ridge Augmentation can rebuild this bone to accommodate the implant. Aesthetically pleasing, natural-looking teeth depend not only on the form and shade of the teeth, but also on the shape and contour of the surrounding gums. In areas where teeth have been lost, the bone and gum tissue in the area lack the natural support of dental roots and will often recede and shrink over time. Another technique more frequently used is an ‘onlay’ (or ‘veneer’) bone graft. In this instance, the area of inadequate jaw bone is exposed, prepared and measured. Bone is taken from the patient’s lower jaw or hip, fashioned to fit precisely into the prepared site and then secured in place with mini-screws. The graft is allowed to mature for several months before placing a dental implant. Ridge Augmentation is a predictable procedure that can correct the defects caused by bone loss and gum recession in areas with missing teeth. More importantly, this procedure allows the chance to return the natural contours of the gums that existed before loss of the tooth. Call us at (403) 278-5446 to book your Ridge Augmentation consultation appointment today!